Having been a barista for several years, coffee has gone from being a beverage that I enjoy on occasion after a good meal (or a long night), to a necessity. While I understand the potential health drawbacks of my daily habit, I have come to accept the fact that coffee will always be part of my morning routine. I’ve tried to make up for my habit in other ways: getting enough sleep (when possible), fitting exercise into my daily schedule (I commute either by bike or walking on a regular basis), and drinking kombucha. I’ve been drinking and brewing kombucha for about as long as I have been drinking coffee, so when I recently learned that it is possible to brew kombucha with coffee I had to give it a try! 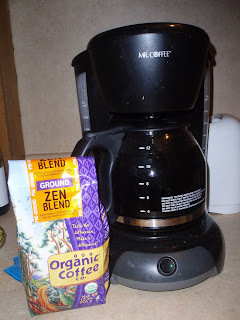 Following a recipe suggested by a thread on www.kombuchatea.tribe.net, I brewed a full pot (my coffee pot makes 10 cups) of the Organic Coffee Co. Zen Blend coffee. I used 1 tblsp of coffee per 2 cups of water. While the coffee was brewing I poured 1 ½ cups of organic turbinado sugar into my brewing vessel, after sanitizing the vessel with warm water and vinegar. 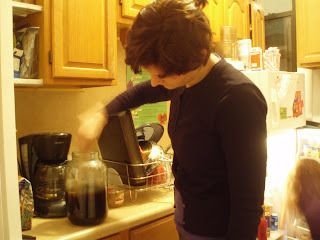 Once the coffee was ready I poured it into the vessel and added two extra cups of warm water, stiring to dissolve the sugar into coffee. After all of the sugar appeared to be dissolved I let the mixture cool overnight to room temperature before adding my scoby. Cooling overnight also allowed my scoby to warm up to room temperature (I normally store my scoby in the fridge when I’m not brewing), so that it did not got into shock when I added it to the brew. In the morning I added my scoby to the koffeebucha mixture, and covered the brewing vessel with an extra coffee filter that I had lying around (consequently, this is also what is recommended by Kombucha Fuel). The directions I was following suggested that koffeebucha takes longer to ferment than the usual 8 to 10 days, so I plan on leaving my brew fermenting for about 14 days before sampling. I am curious to see what it tastes like! i'm not going to lie, i'm very interested in how this tastes. can't wait to get home and see what's a brewin' in my kitchen!! ps sorry for creating a lovely blur in the fridge background!